Ixion have spent the last four years crafting something meticulously detailed and beautifully executed. With just one demo and a full-length album behind them, Ixion nonetheless managed to create considerable interest in Doom circles, by blending melodic strands of Death/Gothic/Funeral/Symphonic and spacy themes to create some quite beautiful Atmospheric Doom soundscapes. That meant the four-year wait for this latest opus has passed with a certain sense of anticipation for what the trio - instrumentalist/vocalist Julien Prat, and vocalists Thomas Saudray and Yannick Dilly - might eventually unveil. Obviously, that unconventional line-up has been retained for 'Enfant De La Nuit': well, why change a winning formula? 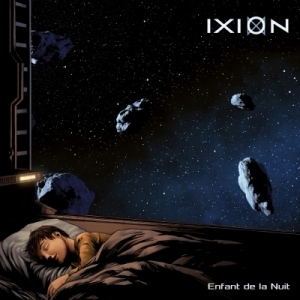 Main composer Julien is perfectly capable of filling Ixion's musical space with just his guitar, keyboards and programming work, while the complementary triple voices allow a wide and unusual repertoire for delivering the storylines. Or, in this case, storyline, for the album appears to be a single concept. Nicely packaged by their new-signed label Finisterian Dead End, the digipack and inner booklet picture a voyage through space towards a new home, which brings the ship into contact with arcane and dangerous knowledge of the mysterious Creators. Sadly, the lyrics - printed in between the lush, graphic novel-type illustrations of Pierre Roussel - haven't really survived the English translation process too well, coming across as fragmentary and opaque hints at a narrative intended to be more complete. Still, there's enough to pick up the gist of what's going on, and, in any case, the frankly sublime delivery more than makes up for it. Boasting a fractionally fuller sound, mixed and mastered with pin-sharp clarity, 'Enfant...' also packs more of a significant Gothic Metal punch than predecessor 'To The Void'. Soaring guitar lines and lilting piano melodies abound between and around plentiful crunchingly heavy Death/Doom riffs and more forceful, sonorous keyboards, playfully varying tempos adding a Progressive influence to the mix. They're familiar elements, almost standard building blocks for bands such as Aut Mori, Forest Stream and Throes Of Dawn, to name but a few, and Ixion at times sound like all and none of them. Pick other examples, if you prefer: the same will almost certainly hold true - the powerful yet quite minimal spread of instrumentation, short (averaging 5 minutes) tracks and avoidance of both exclusively harsh growls and female vocals means that the French trio still maintain clear distance between themselves and pretty much anyone else. Actually, to me, Ixion's balance between cold atmosphere, beautifully melodic sections and deep-space cinematic vastness, might be best described as something like Ras Algethi's Darkwave/Doom tempered by '80s-vintage Tangerine Dream electronics. But whatever approximate comparisons might be made, the net result is a seriously mature work, totally immersive and accessible, yet with a great deal of progression and complexity packed into the compositions. Nothing is wasted, nor over-elaborated: the synth and guitar, free of fussy effects or orchestral emulations, drive each track onwards with a clear purposefulness. Impressive drum programming, all but indistinguishable from the real thing, provides a solid backbone, and the vocal interplay which mixes various shades and styles of clean and growled parts is absolutely a highlight of the album. From the opening, almost poppy, synths of 'Ghost In The Shell' to the final, hanging, question of 'Odyssey's mournful conclusion, there simply isn't a weak moment to be found. 'Enfant De La Nuit' arcs seamlessly between the almost-upliftingly optimistic and the darkly ominous, the journey from track to track becoming a captivatingly continuous voyage of discovery in which time passes unnoticed and swiftly. What can I say, other than it was worth the wait, that Ixion have spent the time crafting something meticulously detailed and beautifully executed, and that it should go straight to the top of the 'next essential purchase' list?